I am not a big baker. I do not bake because when I do, I tend to eat the whole batch of warm whatever-it-is and wind up with a serious tummy ache. A fresh, chewy cookie or muffin is my absolute undoing, so I don’t often offer myself the temptation. However, two things happened over the past week: I completed a major project at work (therefore I needed a reward) and I found this very healthy recipe for orange-blueberry muffins. At first I was skeptical that they would be delicious and satisfying, but they delivered the goods, with tons of fruit and fiber to boot! I hate to use the term “guilt-free” when it comes to food because that emotion should never be associated with eating, ever, but why not? I’m gonna say it! 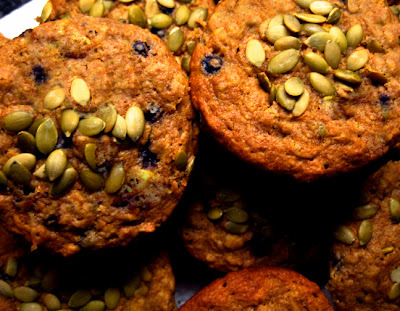 These are hip-friendly, tummy lovin’ muffins…and I ate three when they came out of the oven! –> pumpkin seeds, sunflower seeds, walnuts etc. 1. Preheat oven to 350F. Lightly oil a 12-cup muffin pan. 2. Put the orange juice, oil, syrup, tahini, and orange zest into a medium bowl and whisk until well combined. 3. Mix the flour, oats, baking powder, baking soda, and salt together in a large bowl until well combined. Add the orange juice mixture and combine, using as few strokes as possible so you do not over mix the batter. Fold in the blueberries. 4. Spoon the batter into the prepared muffin pans, filling each approximately 3/4 full. Sprinkle with nuts or seeds. Bake until a toothpick inserted into the center comes out clean (about 20-25 minutes). Let the muffins cool before removing them from the pan. Or, do what I do: take a spoon and desperately dig them out like a complete maniac. These muffins freeze beautifully. Eat half while they are still warm (you think I’m joking? ), and once cooled, put the others in a thick plastic bag in the freezer. Take one out in the morning and put it in your bag for an afternoon snack at work. You will thank yourself for being so prepared and healthy! This recipe comes from one of the best cookbooks I have ever read. It’s called “Enlightened Eating” by Caroline Dupont. Pick up a copy, find food nirvana. I love all of your baking recipes but I think there is something wrong with the measurement of this recipe, it’s way too dry, even after I reduced the amount of flour and oats. Can you please send some advice how I can adjust to the measurement? It came out like wet cookies, is it supposed to be dry like this? Thank you for the advice! Made these yesterday and overall the flavor is pretty good but I did not read the comments before making, and agree that they are very, very dry as-is. I used olive oil and whole wheat flour. They don’t look anything like the photo (moist). I have to feel like there is a mistake somewhere in the recipe? There is something wrong with this recipe. The batter is far too dry. Does it need eggs? It certainly needs more liquid. Ces muffins sont spéciaux. La pâte est très sèche et la texture un peu crumble, comme plusieurs ont déjà dit. Au bout de 25 minutes, ça ne semblait pas encore cuit. J’avais suivi l’avis de plusieurs et mis moins de flocons d’avoine. J’ai ajouté également un peu de lait d’amandes.J’ai ajouté aussi des pépites de bon chocolat noir. J’ai cuit mes muffins en deux batchs (puisque ça m’en a donné environ 18). La première je l’ai finalement cuite environ 30-35 minutes et ça a donné un résultat intéressant, comme si tout mon muffin était du crumble bien croustillant. À la pâte restante, j’ai ajouté un oeuf et les muffins étaient parfaits. I usually adapt any recipes for gluten-free without any trouble, but there is something wrong with this recipe. Way too dry. There should be more liquid or less flour, definitely. Thanks for the receipe. Perfect muffins! Great recipe, but I also had to add a lot of water to thin out the batter. Will try it next time with less flour, thanks everyone for the tips! These were good, but they were a little drier than I would have liked as others have expressed. However, they do become a little more moist the next few days if stored on the counter. And for anyone making these in the future, next time I would use only 1 1/2 – 1 3/4 cup flour in total and only 3/4 cup oats as Deborah suggested – this should help yield a more moist crumb. Making sure to add fruit, like berries or pear (I used pear), helps too. Made these using half oat flour and half whole wheat and only used 3/4 cup oats. And they were delicious. I too am finding that there isn’t enough wet ingredient to mix this properly. I added water until I could get all the dry to mix but that involved a lot of stirring which I think made things heavy and dense in the end. I am looking for the perfect muffin recipe and if there is something I am missing this recipe may be it. I just made these muffins and they taste amazing!!! I didn’t have any blueberries on hand so I mushed up 2 organic bananas and added a cup of bran instead of oats-I can’t stop eating…they’re delicious with the right amount of sweet. Thank you! These muffins turned out wonderful for me. I have tried many healthy muffin receipes but didnot like the taste they had nutrition but no flavour. I did tweak the receipe a bit. I had to add 1/3 cup of milk and it turned out delish they were gone in 15 MINUTES.. Amazing!!!!! This recipe is what I was looking for, many thanks! I had the same problem with not having enough liquid to get the right consistency. I used 1 cup OJ instead of half but its still more of a dough mixture… They’re in the oven now so ill see how they end up. Oh I also used coconut oil instead of olive oil, I wouldn’t think that would be a problem though…?? I have tried this recipe twice now, and have had a bit of trouble. It just seems that there is far too much dry ingredient, for how much wet ingredient there is. Has anyone else had trouble? I had to add a bunch of water at the end the first time, and the second time, I added a cup less flour (which turned out really crumbly and strange). I know these will be really good muffins once I get it right! I love this recipe and the post as I am the same way with baking. I very rarely do it. When I do it is healthy at least with very similar recipes to this. No white stuff especially! And, like you, I probably would have had to eat three. These look amazing. I love your site! I can totally relate to that…no matter what it is that I bake if I know it’s healthy I seem to devour the whole thing!!! !